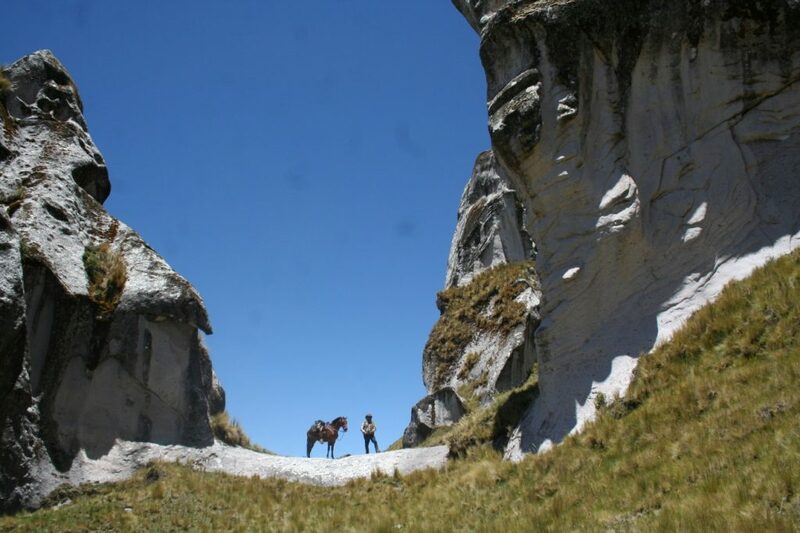 6D/5N ADVENTURE TO THE CÓNDOR´S CANYON - "HACIENDA DEL CHALAN" Horseback Riding - Tour Operator - Cusco, PERU. Peruvian Paso Horse. The meeting point to start this wonderful experience will be the village Zurite in the province of Anta. 09:00 The staff that will carry all the equipment needed during the next days, will be waiting for you in the vicinity of Zurite to be able to meet us, and to accommodate your belongings in our assistance vehicle. We will than continue to saddle our horses that are assigned for us. 10:00 We will begin this adventure at the level of the Pampa de Anta and after overcoming a hill with eucalyptus forest, and enjoying a wonderful view of the Chicón snow-capped mountain, we will start riding downhill until we reach the Ankawasi village (Eagle’s Nest). 14:00 During the afternoon ride we will reach an altitude of 4,000 metres above see level. It is the highest point at this day which is located at a distance of 2 hours from Caserío de Ch’uro, where we will spend the night. 17:00 After an arduous work for our horses, we will arrive to this indigenous community of Ch’uro, which is located at the foot of a leafy forest of Qeuñas (Polilepys Inkana). 09:00 This day we intend to cross a part of the central mountain range, using very old horse paths that connect small hamlets of our mountains. 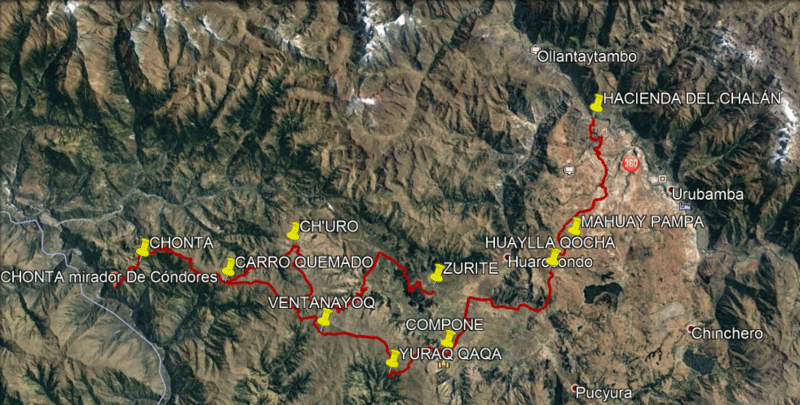 We will arrive at the Pampa Huaylla stream, from where we will begin to ascend to a height of 4,100 meters above sea level. At this height, both our and our horses’ breathing will be accelerated by the scarcity of oxygen. Surrounded by grasslands we will observe scarce vegetation. 13:00 We will have lunch in the grasslands and very close to an old and abandoned vehicle that became silent a long time ago. It seems like if it is the only inhabitant of this unsurpassed spot. A wonderful view of the snowcapped mountains of Humantay and Salkantay will be our inseparable companions until arriving at the Chonta community. 17:00 Arrival in the hamlet of Chonta. 09:00 After enjoying a delicious breakfast, we will meet a guide that will carefully guide us down the steep paths of the condors viewpoint. We will cover this way by foot, as the road is suitable for us to enter but not with our horses. It is narrow and right at the edge of one of the deepest canyons of Peru, the Cañón del Apurimac. 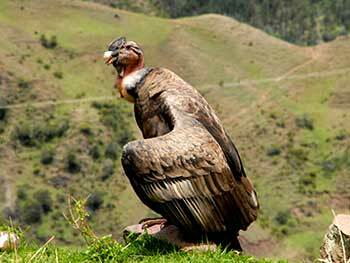 This scenery is the hábitat of the impressive and majestic condor. The same one that nests in the inaccessible rocks and ravines of the canyon. This rugged geography has its own microclimate. 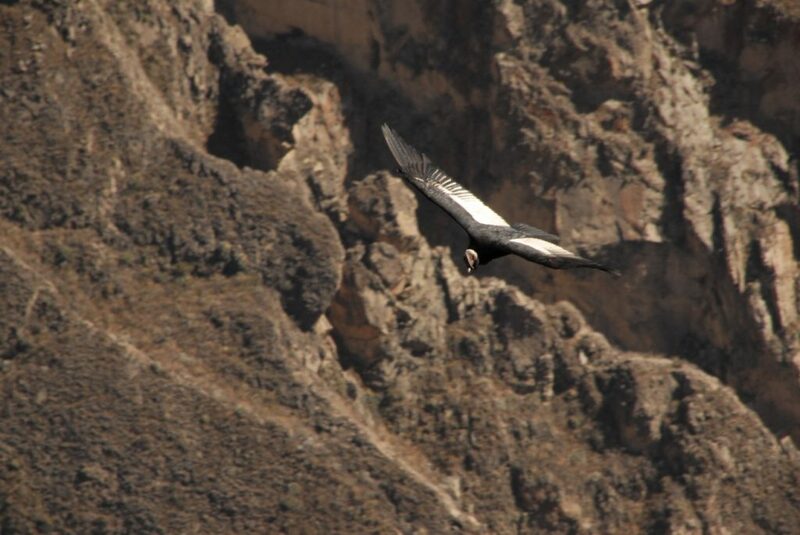 Being so sometimes condors fly over the canyon in search of food in the morning hours and often do so in the evening. Viewpoint 01: Panoramic view of the canyon and the river Apurímac. Viewpoint 02: View of the first rocks and ravines. Viewpoint 03: View of the depths of the abyss. 17:30 Return walk to Chonta community. 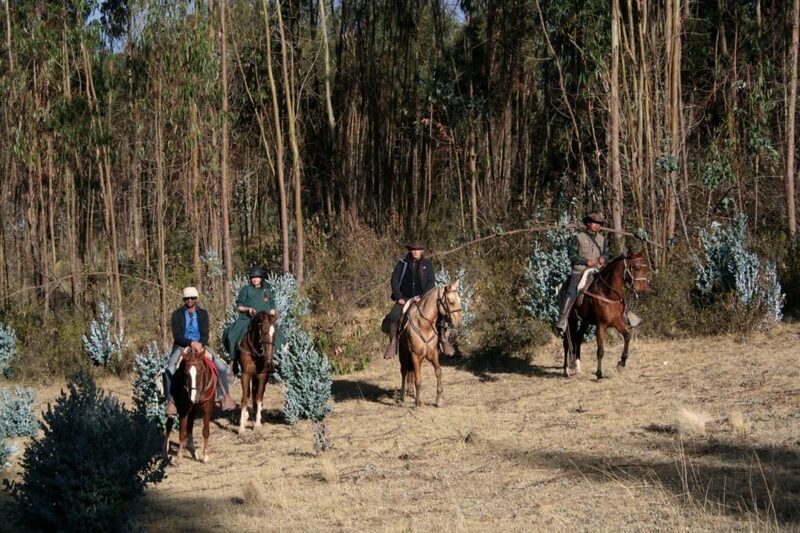 09:00 Horseback ride back to the heights of the grasslands to more than 4,100 meters of altitude. 13:00 Lunch close to the abondoned car. 14:00 The terrain that awaits us to ride during the afternoon will allow us to move more easily until arriving at the town of Pampa Huaylla. It is located in the heart of a ravine; from here we will ride to the side of the stream which is also named Pampa Huaylla, until we reach Ch’uro village. 17:00 Arrival for camping at Ch’uro. 09:00 After an hour of riding uphill, a rocky and difficult road opens up in front of us. This one will take us to reach an indescribable beautiful forest of stones. The stony manifestations of this area seem to be incredible, because rock formations are observed that resemble megalithic buildings of the beginning of our history. Aso there are rocks that resemble prehistoric animals as well as giant birds. Undoubtedly the spots we see of the rocky sets of Ventanayoq, Waachayoq, Quinsa Rumi and Yuraq Qaqa are magical religious places from the beginning of our history. These places are virgins to guided tours, they are a kind of field studies. 14:00 Recognition walk through the lithic collection of Yuraq Qaqa. This place, due to its capricious morphological characteristics, was adapted to the use of locals for a long time. They hid the cattle or horses here that they stole from different towns. This natural corral camouflaged and concealed by the dense forest of Qeuñas and endemic shrubs has been used by astutely rustlers. 15:00 Downhill ride to the town center of Compone. 17:00 Arrival at the lodge of Compone. 18:00 Dinner and overnight at the lodge of Compone where it will be finally possible to take a hot shower. 08:00 After a good night of rest, the breakfast of our last horseback riding day is waiting for us. 09:00 During the morning horse ride we cross the flat Anta área from one side to the other, passing by the towns of Markjo and Huerta. After passing through an eucaliptis forest, we will arrive to the town Huaylla Qocha and it’s beautifull catholic chapel contructed in the XVI century. 13:00 Lunch in Huaylla Qocha. 14:00 The last afternoon ride on which we will see on the way different water reserves in the high comunities of Chaquepay, Mahuay Pampa and Maras. Maras town again draws our attention giving us the oportunity to discover different ancient little streets and it’s tipical gates. Just after passing Maras town, we start our descending ride in the direction of the valley. 17:30 Arrival at the Hacienda del Chalán in Paucarbamba. Visit of the Inka agriculture complex of Zurite. View to the Chicón snow mountain. Panoramic view over the Anta flat area. Grow area of native potatoes. Colonial chapel of Huaylla Qocha. Viewpoint over the Huaypo lake. View to the Humantay and Salkantay snow mountain. 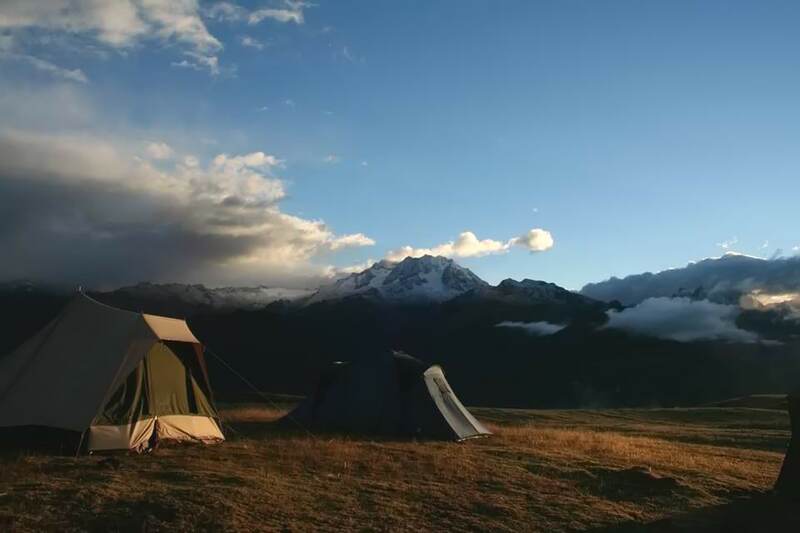 Incomparable panoramic views over the Sacred Valley and the snow mountain chain of the Andes. WE ATTEND: Mondays – Saturdays. Volunteers or students: $5 USD discount on the ride by showing your student card or volunteer permission. CAPACITY: 1 – 10 participants. Alimentation (5 breakfast, 6 lunch, 5 dinner). Professional Guide / experimented rider. 4 nights in tents and 1 night in bungalow accomodation. First Aid Kit with oxigen bottle. Picking up or dropping off service (we can organize it aditionally). First days breakfast and last days dinner. Comfortable clothes to ride, hiking shoes. Small back-pack with personal ítems and one normal luggage for in the assistence vehicle. Water bottle (to fill up) and preferred snacks.